Patch 6.1 is due to arrive in five days. Apparently it "contains nothing". If vaccuum could be shaped into a patch this would be it. ;) Despite this, I found some things I'm gonna do when it launches, and decided to make it into a list, because that's what people like me like to do. Additions that will provide me with additional stuff to do beyond "managing" are highlighted. Heirloom Tab: Not much to do here, just gonna log through my alts and make sure everything gets added. Dwarven Bunker: Daily follower-upgrade token for Iron Scraps. 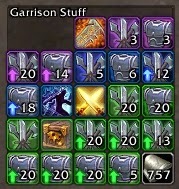 Garrison Music Box: I already have an addon that lets me play the music I want in my garrison, but I'm gonna be collecting stuff for the Music Box anyway. Because it seems like fun. Darkmoon Faire: Gonna head over and check out the new stuff! Raiding with Leashes III: I will be chasing battle pets in Black Temple, Hyjal Summit, and Sunwell Plateau until I get my little K'ute. I am slighly annoyed that it can't battle, but I still want it. I still have several characters that need transmog gear from those places, so that fits nicely. In addition I will use the free "insta-level 25"-stone on one of my level 1 battle pets. And I might help my partner finally opening up his menagerie. Apexis Crystal-dailies: I might jump on the option of doing other Apexis Crystal-dailies instead of those that are offered. Either for the currency (pets and mounts), achievements or reputation. What A Strange, Interdimensional Trip It's Been: I like achievements, so I will try to remember to bring Pepe with me when I go on my weekly slaughter. Alchemy: Start transmuting Savage Blood. Cooking: Recipes for 125 stats. Add Piccolo of the Flaming Fire and Ruther's Harness to my Toybox. All of my Draenei males are AFK as well in their garrison, basically collecting Draenei girl followers from Inn... I do wonder why I buy subscription still :/ only because of my love of Draenei as a race probably..